The winners of Cheshire West and Chester Council’s Victory Garden competition have been announced at a special celebration event. The Victory Garden Initiative was set up during WWI by the Ministry of Food to encourage people to grow their own food. The competition was launched to mark this year’s centenary of WW1 and was sponsored by ESSAR. Since the launch of the competition earlier this year, schools from across the borough have been busy planting seeds and caring for their vegetables and fruit. 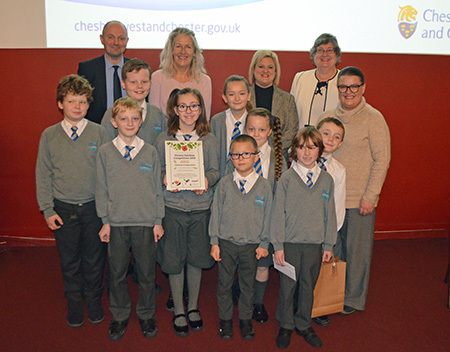 The overall winners of a Gold Certificate were Dee Point Primary, Blacon, who impressed judges with their well-researched and attractively presented garden. They also demonstrated clear plans for the future which include expanding the garden with the involvement of the local community. Sliver certificates were awarded to Christchurch C of E Primary, Rivacre Valley Primary, Meadow Primary and Ashton Hayes Primary. Councillor Louise Gittins, Cabinet Member for Communities and Wellbeing, said: “The Victory Garden competition has been a wonderful success. The competition was a great way for schools to get involved in marking this year’s centenary of the First World War and creating a real community feel about the creation of a vegetable garden. The celebration events included a presentation on food in WW1 presented by Dr Tim Grady from the Department of History and Archaeology at the University of Chester and a performance of songs from WW1 by musician Matt Baker with his Remembrance Choir.